It was another evening where I gather with my friends to watch the latest Nigerian Movie to hit the big screens.. yes I do plan outings with my friends to go watch Nollywood films at least once every 2 weeks. This time it was to go watch O.C Ukeje’s latest film North East, which also happens to be Ini Dima-Okojie’s first major role in a feature that hit cinemas. The truth is that since the beginning of 2016, I and my friends have gathered to watch at least 15 Nigerian films in the cinema and while there have been a few misses, we’ve mostly had a great time delving into different stories from different genres with some not so amazing acting and some down right spectacular acting! While the title and poster of North East ensured that some of us had to be convinced to actually show up (it does look a little corny and unimaginative), by the end of the movie, all of us had awesome things to say, and if we were Hollywood movie audiences, we would probably by delivering an A or A+ Cinemascore right about now. 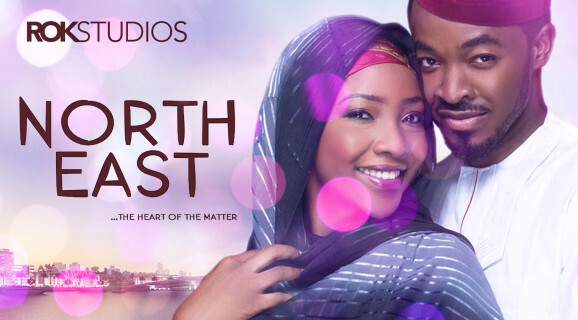 You see, ‘North East… The Heart Of The Matter’ is the simple story of a young lady from the Northern part of Nigeria and a young man from the Eastern part of Nigeria who happen to be living in the Western part of Nigeria and just so happen to fall in love. True to form, there’s obstacles every where and while it would be nice to dish on these obstacles, it would be even nicer to let you discover them when you’re watching the film. All I’m going to say is that while the regular obstacles that may come to your mind exist, there are some unique ones these two have to tackle to be together. O.C as usual delivers in his role as Emeka, Mr. Young Swagalicious Hunk, but the breakout performances for me where from Ini Dima Okojie as beautiful Hadiza who appears gentle and simple but is Ms Fireball and so so defiant also from Gbenga Titiloye as her dad Musa who just could not believe that his daughter’s love life would be the ruin of his! Ta! I have let something slip o… or have I? Well, while the entire cast, including Carol King as Emeka’s mom Ijeoma and Saeed ‘Funky Mallam’ Muhammed as substitute love interest Aliyu totally deliver, my most cherished feature of North East is the script and directing. Muyiwa Aluko has won over a new fan. This filmmaker took a simple tale quite familiar to Nigerians, added a few quirks, developed an amazing script, infused it with even more amazing dialogue and directed one of Nigeria’s most coherent romantic films. It doesn’t hurt that the chemistry between the cast was oozing off the screens or that the genius messages in the texting scenes brought even more life to the entire movie. What sold North East for me was the fact that it just flowed smoothly. It didn’t go over board, continuity was impressive, and it just felt genuine. Well to ensure I wasn’t under the influence of some narcotics which excited my senses the faithful night I saw #NorthEast the first time, I have plans to see the movie again in the cinemas with even more friends (something that has happened just three times in my entire life). So my people, forget all your prejudice towards Nigerian films or Nollywood in general and give North East a try. I can assure you that it’s a good watch and something young people would even love. P.S. Ini was just looking fine throughout this movie sha!!! Hmm. Apologies for the grainy image up there, couldn’t find one with better resolution online. By the way, I came across a movie called Love Regardless when researching some background for North East… Hmmmmm. Iroko here I come.